The Peppermint Pony - F.A.Q. How much room do I need to have a party? All you really need to do is provide parking area with a way to get out- the rest is easy. We prefer to work in front of your house. We do not work in alleys nor drive through them. Sidewalks and cul de sacs are great for pony rides - kids LOVE showing off 'their' pony to their neighbors. A special treat can be an extra-long birthday ride through the neighborhood for the guest of honor, time allowing. In Maryland, horse use on public streets is COMPLETELY protected under the law by lots of archaic laws that have never been taken off the books since horses stopped being our primary method of transportation. You do not need permission from your Homeowner's association if your road is publicly maintained and owned. Our service area is so large we do not have a list of parks that allow ponies, and policies vary widely between different municipalities. However, we have found that if you are in an urban area it is worth contacting your local community center or church. Frederick County Parks allow you to have us at their facilities. Chick Fil A often hosts pony rides for their family nights, and they will rent you party space so why not call your local outlet to see if they would allow us there as well? The client is responsible for securing any and all permissions for our services AND the payment of fines if not. Fees will be due in full regardless. Do you travel to parties? Where do you go? Unfortunately, with our small-scale operation we cannot afford the necessary health certificates to cross state lines for parties. Washington D.C has informed us that they will seize our ponies if we do not have a permit, which requires a health certificate that costs $75 for each pony and is only good for 30 days. There are some parks in Montgomery County that border WDC that can be used for our parties. This is a party for a one-year old? Is that old enough? A child's first birthday is a milestone in many cultures, and often the reason for a huge family celebration. Any child that can sit up unassisted is old enough to ride a pony. A baby's first birthday is an ideal time to celebrate - they often will suddenly start talking that day, if only to say a word they have made up for 'pony'. One year olds are remarkable unafraid. And the pictures are priceless. Children who want a pony party are never going to be deterred by a little drizzle, however, we are happy to offer face painting in lieu of the pony party in case of inclement weather. Satin and storms don't really gell - so our costume choices on rainy days will be more on the durable side. Please see our Policy Page for more details. Good communication is a must. approximately 50 feet of parking space along your front yard by blocking it off ahead of time. The ponies come off the back of the trailer. 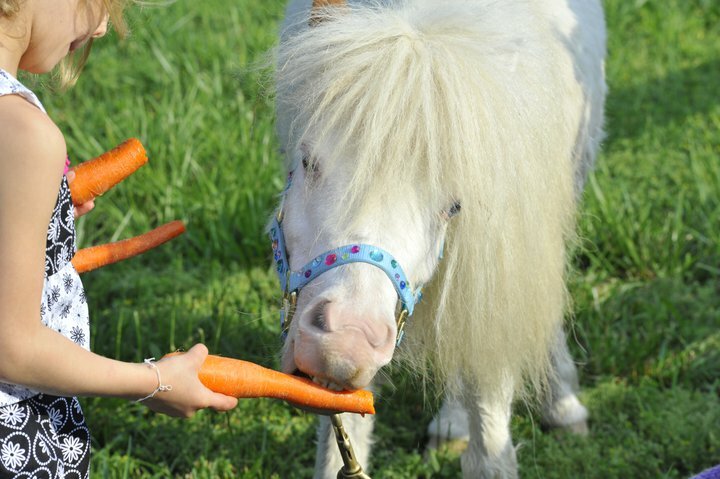 We work in your front yard, so that the mini horses can be tied and graze safely and children supervised around him. We have a low hitch and need a non-hilly place to turn around, or an exit route out of your neighborhood. Adequate adult supervision - all toddlers must be held by the hand while standing near the ponies. 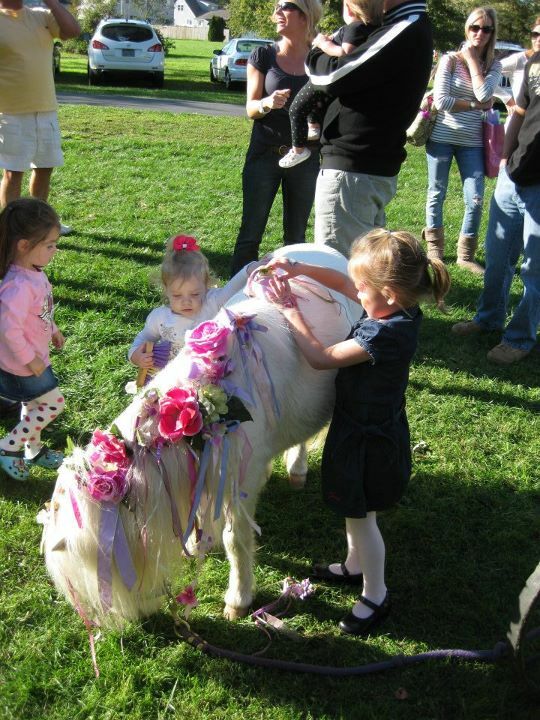 We will expect adults at the party to stay close to the ponies while the children are interacting with them, and to help keep the ribbons and brushes off of the ground. We expect parents to help their children mount the pony - it's a wonderful opportunity for shared trust and elation. Please have your dogs crated or otherwise enclosed for their protection. If there are dangerous or distracting dogs in the neighborhood, please consider contacting your neighbors in advance. Barking, ambushing dogs can alarm and startle the ponies. If the handler feels the ponies are threatened she can elect to leave the party site with no refund. All active play and Moon bounces must be confined to another area/back yard, including balls/riding toys/sleds/guns/water elements/anything that can be thrown/games. Other than that, a bag of carrots and a few pieces of cake as the ponies depart are always appreciated! Our ponies loooove birthday cake, and the children love the spectacle of ponies gobbling messy icing and cake. Our goal is to provide every guest with the best possible experience as they ride the pony and receive their other services- at times this may take all of our attention. Adults are expected to be interactive at our parties. A separate attendant for the mini horses can be hired, and is required for larger parties where alcohol will be served. We will have rules posted and ask that all you guests be present for the introduction. Ponies will be happier without sudden movements and that if you put your fingers in the pony's mouths, they can't really tell fingers from food. Children must be able to move out of the way of the mini horses, so cannot be allowed to kneel, sit, or lie within their reach. Ponies are fine with loud noises from happy children, but dislike screaming/crying, being kicked by a tantrumming or out of control child and cannot tolerate objects swinging around them or hitting them or balloon bursts or being squirted by water guns (yes I have dealt with all of this!). Children may not run after the pony while it is giving rides. Proper footwear is a MUST. Bare feet are a no-no while grooming the ponies, especially when standing on pavement. Our ponies have these jobs because of their patience and love of their work. My mini horses are not kickers and do not startle easily. Riding ponies require the 'respect' you would offer a normal sized horse. Can we feed the ponies? The last ten minutes of your party will be carrot feeding time. Please keep the carrots under wraps until then, so the riding pony doesn't get grumpy while the mini horses get all the goods. 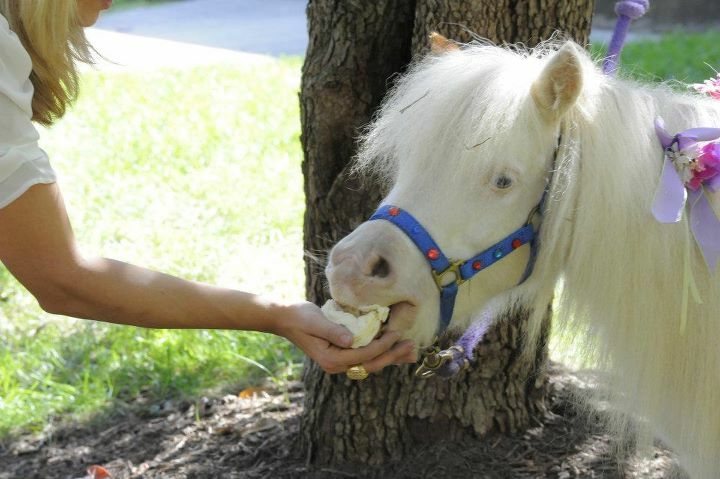 Only the mini horses can be hand-fed. The riding pony can have the stubs fed to him on the ground. SPECIAL NOTE - if you have friends or relations who consider themselves horse people - please ask them not to 'teach' the children how to properly feed a horse, or try to have an independent feeding session prior to the end of the party. We do NOT do flat-handed feeding of treats to our ponies, ever. They are specially trained to *only* take carrots fed our way, or cake off of a plate at our parties. Feeding them by hand, or before it is time, can make them nippy and we don't want that. Can we decorate the ponies? Of course! We supply a variety of beribboned flowers and bows that can be pinned on the mand and tails of the mini horses, and enough pony brushes for all the children to have one. The ponies have all the standard inoculations (including rabies), worming, foot and dental care. 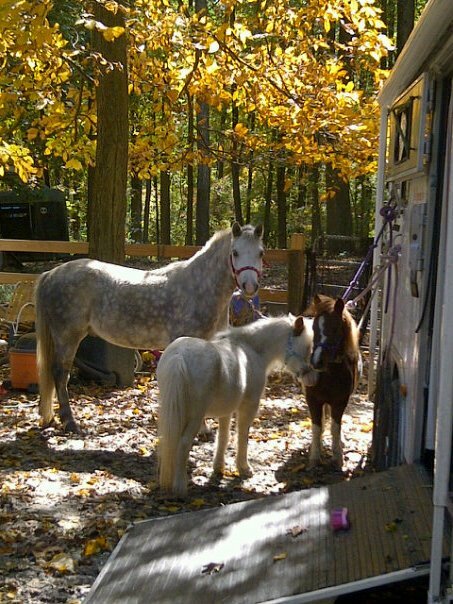 They are our show ponies and our treasured family members. They enjoy traveling and working. We do carry liability insurance. The USDA does not have jurisdiction over pony ride businesses as they do with petting zoos so no licensing is required. Horses and ponies do not transmit diseases to humans such as e.coli, salmonella or botulism - so stash the hand sanitizer, relax and enjoy! Can anybody ride? Who can come to my party? 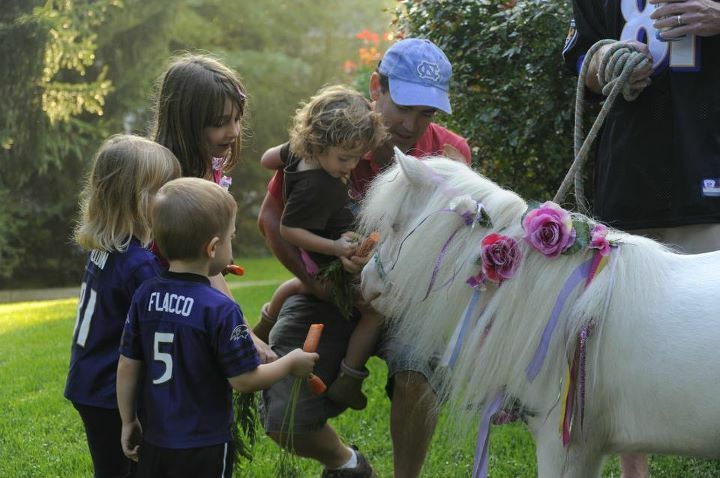 Pony Parties are for small children. Our riding ponies have a weight limit of 65 lbs. All children over toddler age must be able to shift their weight into the middle of the saddle and maintain that position throughout the ride. Special needs children may or may not be accommodated depending on individual situations. we are not a licensed therapeutic riding service. Our ponies are not trained as therapeutic riding animals and are not tolerant of certain behavior. Ponies are large animals. They are only as safe as the people around them. They can move quickly at times and there are no physical barriers between the animals and people at this party. physically capable of following directions, in English, in a reasonably quick fashion. Any guest (adult or child) without the ability or willingness to follow directions when told the first time must be accompanied at all times by an adult who will take on the responsibility of anticipating and preventing any unacceptable, reckless, or hazardous behavior, and be capable of physically removing them from the scene without delay, if necessary. We will leave without a refund if we feel a safe atmosphere cannot be maintained or will not be provided. Any damages incurred to animals, equipment or staff because of lack of guest supervision will be the obligation of the host, per your contract with The Peppermint Pony. Know your guests! Responsible parents will know my intent is one of maintaining a safe and happy atmosphere for everyone at your party, and appreciate our sharp eyes and quick reaction times. We cannot have clients who would rather risk the possibility of a pony untied and perhaps set loose by an unsupervised guest who is incapable of and/or unwilling to follow directions (yes this has happened more than once) . Special needs facilities MUST give us notice of this in their quote request, no exceptions or deposits will be forfeit. The decision of the handler is final. NOTE: NO ADULTS MAY MOUNT THE PONIES. DOING SO WILL CAUSE US TO LEAVE YOUR PARTY IMMEDIATELY without a refund!! Our riding ponies are trained to walk ahead while we are at their side, allowing us to grasp your child firmly at all times he or she is mounted. You are welcome to walk alongside, but please do not allow the child to hold onto anything but the saddle horn. Helmets for riding are unnecessary. An ill-fitting helmet is more dangerous than a bare head...it takes many minutes to fit a helmet properly in fact it can take hours in a tack shop to fit one's head. Please, for safety's sake - NEVER allow a poorly fitting helmet on your child. Safety is our first priority - ahead of feelings - so if we speak sharply it is to ward off a disaster that we, as experienced horse professionals, can see coming. Please to not take offense, as none is intended. We will be happy to explain and educate once the moment has passed. Generally the ponies 'hold it' for the trailer ride, but if they should slip, we have rakes, forks and brooms to pick up after them. Horse manure is great for the garden - some folks beg us to leave it for them - that is entirely up to you. Horses do not carry diseases contagious to humans, so their urine, manure or its residue is not a danger in any way. I've put off making arrangements and now my day has been taken! Can you come later in the evening? The ponies are just as happy to entertain you under your floodlights - something to think about on those hot summer days. We're going to have a moon bounce - is that a problem? No, not at all. In fact many times we are not the only attraction! We prefer it to be located away from the ponies as the generator and fan is very noisy, and our staff needs to be able to communicate verbally across the party area. Can we offer you a glass of wine? Please keep an eye on your guests, especially those to whom English is a second language and might not understand our our staff when spoken to. It is imperative that your guests understand and respect the 'personal space' the ponies require. Alcohol releases inhibitions, including interaction with animals so we require advance notice if you are serving it at your party as we may add additional supervision to your budget (pony body guards!). At our discretion we may have to leave the party early if we feel the guests are endangering the safety of the children or ponies through inappropriate behavior. We employ attractive teenage girls who are hired to entertain and supervise your children - not your male guests. They are a vulnerable, captive audience so we have a policy of not allowing men to converse with them unless it is on the topic of the children at the party. It's winter - is it worth having ponies? The twin adrenaline pumps of a party and ponies is enough to warm the tiniest toddler. So long as it isn't excessively windy, your children will enjoy the novelty of our four-legged fur-balls. Winter bookings are generally last-minute, and weather must be forecasted as clear for two hours prior and after your party to allow safe travel. a good comparison for pricing horse rentals is the rental of a piece of heavy equipment and an operator, which represents a similar level of expertise and capital investment. Imagine asking a man like that to take drive a rig an hour away that probably gets 5mpg like ours does - for 'just an hour' of his weekend, to dig 'just a little hole'. While his machine sits idle when it isn't being used - we have the endless overhead of pony care, insurance, advertising, emergencies, etc. that continues all calendar year in addition to our vehicle and trailer cost - while we are only booked seven months at the most. Add to that, the fact that we can make these fees (and our income) during *two days of the week*, during a few daylight hours, and that many holiday weekends are rarely booked. That man with with a Bobcat or backhoe can work most of the year, all seven days of it with the same demand, and under the lights if necessary to make the most of decent weather. And no one thinks twice if the "Bobcat Guy" has a criminal record, or shows up filthy and reeking of his misdeeds. There is no such thing as a stupid question! Ponies are horses and are the same species. All ponies are horses...but not all horses are ponies! Strictly speaking, a pony is a horse of a certain small size, 58" or less when measured at the top of the shoulder. People who love them know that ponies tend to have a particularly charming character that is subdued or lacking in their larger brethren. Just as a small terrier seems to have more 'personality' than say, a Mastiff, so do the ponies act more expressively on the whole. To complicate things, Miniature Horses are just that - they act more like little horses, than ponies...IF they are truly Miniature Horses and not just mini sized Shetland ponies. Our Easter Lily, on the left, is registered with the "tough" registry to get into. She is very refined, like a 'midget' person, very proportional. Pocohantas on the right, while she has one of the prettiest faces you will ever see on an equine, obviously has more 'pony' blood in her, as evidenced in her more dwarf-like body. She is much heavier and stronger than Lily, but barely an inch taller. Your deposit, also called a retainer, is legally considered a "booking fee". It is not payment for a 'service'. It is payment to reserve your time on our calendar, and is non-refundable as it is necessary to cover the overhead our business generates and the income lost by being available for you and only you, on that date and time. The deposit you put down gets subtracted from your total, to give you your "balance due". More policy questions are answered here. We have successfully defended our right to keep your booking fee in disputes with credit card companies. Should the client exhibit uncivil behavior before their party, whether over the phone or in writing - which would include the use of profanity, threats, insults to character etc - their deposit may be forfeited. Our parties require good communication and rapport between myself and the host and hostess - should any conversation deteriorate into rudeness prior to a deposit being made, any offer or quote will be null and void. Although we understand that sometimes, in the pursuit of the "perfect party", tensions can rise at times - Miss Angela expects all persons involved in the arrangement of your party to be on their very best behavior. If we (whether it be myself, my children or anyone else in my temporary employ) are verbally assaulted, groped, or threatened while at your party, we will leave your party immediately. The police will be called and a theft of service report will be made in your jurisdiction if payment is not made in full on the spot. Threats of libel and character assassination will be treated seriously and we have an attorney willing to work Pro Bono on our behalf in these circumstances. If we should not be able to provide a service for whatever reason, our obligation only goes so far as a returned deposit at our discretion.